Imagine making a mistake in your youth that you regret greatly. It’s something that drives you to change for the better. You do everything in your power to make things right – except owning up to your mistake. What do you think will happen when you finally have to come right out and admit it? 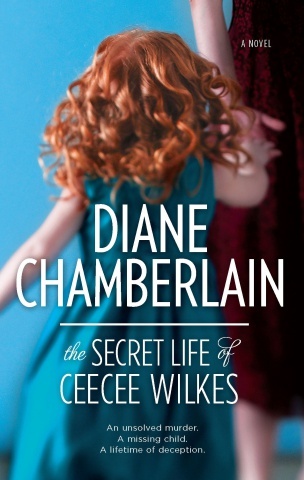 The Secret Life of Ceecee Wilkes by Diane Chamberlain is about just that. This is the story of Ceecee Wilkes. She helped commit a crime in her youth because she thought she was in love with the guy who got her involved. Being young and naïve without any adult guidance or supervision, she ended up being in over her head with what she had done and had to live with the consequences of her actions up until she eventually got married and had a family of her own. As much as I don’t want to go into too much detail about the book, it’s hard to share how I felt about it without sharing what happened. Ceecee ended up taking care of a child that was born during a kidnapping gone wrong. She was too young and afraid and ended up taking care of the child as if she was her own. The time came, however, when she had to admit to the mistake she made of not telling her daughter who she really was and how they came to be mother and daughter. Drama ensues. I really wanted to like this book. I really did. The book had some good moments, particularly with the dilemma that Ceecee had when she was left with the baby when she was only 16. That moment where she wanted to return the baby but was too afraid to do so. I totally get that a young girl who has had no adult guidance in her life (apart from letters her mother left her before she passed away) would be so confused in the moment and would make the mistake of running away with the child instead of giving her back. The part that was difficult for me to understand was how she could live with the lie until the child became an adult. It took having her ex-boyfriend on death row for her to come forward and admit that her daughter was not hers and was that of the Governor who lost his wife to the kidnapping all those years ago. I felt that it was also too easy the way that the ending was resolved with everyone accepting what has happened and reconciling everyone like nothing extreme happened. I guess I felt that it was too forced an ending for me. My feelings about this book are conflicted. On one end I did feel for the main character but on the other, I found this book difficult to read for some reason. I was glad when I was finally done with it even if I didn’t feel like it had an ending that satisfied me. It’s not one of those must-share books for me, but it’s not completely bad either. I guess the most I can say if anyone is interested in this one is to read at your own risk.